The artist explained how her political beliefs have developed over time in the 53-minute Q&A session. M.I.A. was recently a guest at the Oxford Union, where she participated in a 53-minute Q&A session on the ongoing refugee crisis, the beginnings of her career, and Trump's presidency. "Being a refugee was something that, when I started singing, I was really proud of," she said. "Now, being a refugee is forever changing. We're still a blob in the world that's kind of faceless. No one is able to say why are these people or why this is happening." Speaking about Trump's first 100 days as president, M.I.A. noted that he had already bombed Afghanistan. "No matter how smart we are and how much technology we have and all the capabilities, we don’t know who is making the most money out of the war industry,” she said. 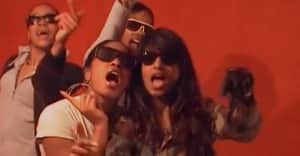 Watch M.I.A. 's full Q&A at the Oxford Union above.